Anyone who has ever picked up a comic book knows how meaningless death has become within the superhero genre. Nowadays especially, characters come and go in a fast, revolving-door fashion; there have been four different Captain Americas over the last five to ten years (with another apparently on the way). Even the most sacred characters to ever grace the page of comics has died at some point or another, yet there are few comic book deaths that actually stick. Bruce Wayne “died.” Hal Jordan “died.” Steve Rogers “died.” It’s become so commonplace for characters to die and be resurrected that we as readers are completely numb to it at this point. But every now and then writers will introduce a character so important or powerful or God-like that they are invincible. Or at least, they’re supposed to be. Despite being touted as immortal, invincible, and indestructible, these characters ultimately meet their demise. Here are 15 Invincible Comic Book Characters Who Can't Stop Dying. You can’t get much cooler than Optimus Prime, leader of the Autobots in the Transformers series. Optimus was legendary in the series’ lore; he was a brilliant military tactician with leadership skills that rivaled those of history’s greatest. He was a childhood hero to anyone who grew up in the ‘80s, and one of the biggest pop culture icons at the time. It’s hard to imagine the shock that was felt when he was killed off in 1986’s Transformers: The Movie. After a brutal battle against Megatron, Prime succumbs to his wounds, tragically passing away surrounded by his teammates. The death of Optimus Prime was probably the most impactful thing to come out of Transformers: The Movie. The problem now, however, is that everyone wants to recreate this emotional impact. Since 1986 Optimus has died in every single incarnation of Transformers. He was stabbed through the chest in the second Michael Bay movie, blown up in the Beast Wars show, and sacrifices himself so many times it’s impossible to count in the various comic runs. It’s gotten so bad that whenever a new Transformers comes out fans simply roll their eyes at the prospect of yet another Optimus Prime death scene. There’s even an entire page on the Transformers wiki that is (sarcastically) dedicated to the subject! Although it originally started out as an alter-ego for the hero-turned-villain Hal Jordan, Parallax was later retconned into an alien being created purely out of the yellow energy of fear. Because the character has no physical body, Parallax can manifest itself in any form it sees fit. It also has the power to possess the bodies of anyone who shows even the slightest hint of fear, making it too powerful for someone as strong as Superman or Wonder Woman. We can forgive its first death, as it came with the sacrifice and redemption of Hal Jordan while he was possessed. What we cannot forgive is the fact that this so-called “immortal being” has been killed in such simplistic ways throughout the years. Don’t even get us started on the horrible death it received in the crapfest that 2011’s Green Lantern, where it gets sucker-punched into the sun. Or then there’s the newest entry into the list, where it is under the control of Sinestro (shouldn’t it be the other way around?) and gets disintegrated alongside the rest of the Sinestro Corps’ home. Of course we know that we haven’t seen the last of the fear-powered being, and we look forward to finding out what creative way it'll going to get destroyed next! Is it cheating to use a character whose power is to literally cheat death? Craig Hollis, better known as Mister Immortal, was a character that was created specifically for the comedic Great Lakes Avengers series in 1989. Unlike their New York counterparts, the Great Lakes Avengers were hilariously incompetent at their jobs. Mister Immortal had the power of (you guessed it!) immortality; much like Deadpool, Hollis was able to come back from even the most gruesome of endings. Mister Immortal makes this list because, unlike Wolverine or the Merc with the Mouth, he has no regenerative powers. Whenever he is injured, it takes just as long for him to heal as a normal human. He can literally only resurrect himself from death, and his demise occurred in almost every single issue of the series. It was often the series’ source of dark humor, with Hollis only discovering his power after attempting suicide several times. Every issue he meets a grisly demise only to return to the land of the living; he’s been decapitated, electrocuted, shot in the head, crushed, drowned, and even blown up. Forget Hydra Bob, we think Mister Immortal needs to show up as Deadpool’s sidekick in his next film. Ah yes, Vandal Savage. The “Immortal Tyrant.” He may have started out as a Green Lantern villain, but the character has risen in popularity recently due to his prominence in the Arrowverse. Unlike many of the other entries on this list, Savage isn’t immortal because he has invulnerable skin or super strength; instead, he was exposed to radiation from a meteor all the way back in prehistoric times. This radiation made it so he could never die (like, from anything), and the character has terrorized the world for over 50,000 years. Some iterations of Savage give him superhuman abilities, but none so far have made him completely invincible. This is evidenced by the fact that he is easily offed three times in DC’s Legends of Tomorrow by a few superheroes that are considered B or C Listers. Before that, he was reduced to a pile of ashes by his own ancient magic on Arrow. In the comics, Savage was tricked into being blown to pieces by his own Red Rocket nuclear missiles, and also encountered several “no-win” scenarios like being stranded in space or trapped in a desolate alternate dimension for eternity. We just know this one is going to open up a can of worms… but General Zod’s death was the one heard ‘round the world in 2014’s Man of Steel. People were extremely angry that the Boy Scout known as Kal-El would ever commit such an atrocity as killing his opponent in cold blood. We’ve covered this controversy numerous times and we’d like to remind everyone that it wasn’tthe first time Zod has died. Hell, it’s not even the first time Superman has done the deed himself! Obviously the most well-known death is the one where Superman snapped his neck like a twig. But did you know that Superman straight up executed Zod and his minions via a powerful form of Kryptonite in the comics? So much for truth, justice, and the American way. Then there was the completely hilarious death of the rebooted Zod from the mid-2000s; he is killed when he throws all his strength into punching a de-powered Superman. However, Kal-El regains his powers as Zod loses his own, and Zod is killed upon impact. The Earth-15 version of the General gets killed by Superboy Prime simply because he isn’t as crazy as his other Earth counterparts. He may have been a letdown of a villain in the last Avengers movie, but comic book Ultron is a force to be reckoned with. The AI is a brainchild of Hank Pym that crazy and coats itself in Adamantium (not Vibranium, dang it! ), turning himself into the ultimate killing machine. There are no playful “No Strings On Me” songs. No one-liners. Comic Ultron is a downright terrifying enemy that gives the Avengers more trouble than any other non-cosmic villain. But of course, like every other villain to grace the page, our heroes always came up with a way to stop him. Because Ultron was a robot, he was allowed to be killed much more often than most during the Silver and Bronze Ages. Much like in the 2015 movie, Ultron is taken out in his first appearance by Vision before rebuilding himself in an upgraded body. You want to know how many times Ultron has “died?” Well, before Marvel rebranded itself with the “All New, All Different” moniker, we were up to Ultron Mark 18. After this version bit the dust, Ultron stopped trying to upgrade himself and simply kept returning from the dead in a new body (often to be defeated by a computer virus). He may have the characterization of a wet rag and nothing more to his motivation than ”PUNCH SUPERMAN!" but Doomsday will forever be known as the unstoppable Kryptonian force that killed Kal-El. This character was created for one reason and one reason only— to one-up the Man of Steel in every single way. Doomsday is stronger, faster, and more invulnerable than Superman, and has several protruding bones that can pierce Kryptonian skin. If Superman is invincible, then what does that make Doomsday? Easy to kill, apparently. Despite being the most powerful villain to ever appear in a Superman comic, Doomsday dies a lot. In both Batman V Superman: Dawn of Justice and the original Death of Superman story he is killed right before he kills Superman. As he becomes impervious to whatever killed him last when he is resurrected, Doomsday was killed multiple times as a child as part of his training. He’s also been beaten to death by a group of Kryptonians, ripped in half by Superman, and incinerated by the villain Imperiex. Are you really immortal just because you can resurrect yourself? Like… Ra’s Al Ghul can definitely die. But then he just has his cronies take him to the nearest Lazarus Pit and voila! He’s as good as new. Ra’s has gone on like this for centuries; his true age has always remained a mystery, but the character claims that he has been around for at least 500 years in Batman: Son of the Demon. That’s a lot of time and a lot of deaths! This begs the question: How hasn’t Ra’s Al Ghul died? The head of the demon has been impaled, blown up, killed in a train crash (which then also proceeded to blow up), drowned, and has succumbed to radiation poisoning. And that’s not even a fraction of his deaths! Despite his invincible nature, writers at DC keep trying to convince us that every time he dies it will be the last. As morbid as it sounds, it’s honestly become kind of comical to watch Ra’s Al Ghul get killed, knowing that he’ll be back to normal for the next story that needs him. En Sabah Nur (better known as Apocalypse) is a force to be reckoned with in the Marvel Universe. The ancient Egyptian mutant has powers that vary from “the most powerful mutant to ever exist” to “an omnipotent god of the universe”, depending on who is writing him. Either way, Apocalypse has gone toe to toe with the Incredible Hulk and not only lived to tell the tale, but actually defeated the beast. Although he has been killed off a decent number of times, it usually takes a lot to bring him down. Take, for example, the latest X-Men movie. It takes the combined efforts of Magneto, Cyclops, Storm, and the freaking Phoenix Force to finally kill the villain! He has also suffered fatal defeats from the mutants Stryfe and Cable, who are both said to be destined to bring down Apocalypse at some point or another. Magneto was able to rip him completely in half during the Age of Apocalypse arc. There was also the story in which the X-Force murdered him in cold blood when he was still a child. Of course, in all of the above cases it seems like Apocalypse is only able to be bested when either A) he is extremely weakened or B) the writer needs him to die. In our books, that’s pretty good! No… this one totally counts! Yes, a character with such powerful regeneration abilities like Deadpool can never truly die. The character has even come back from being a single speck of blood. But that doesn’t stop different writers from trying. Much like our earlier entry for Mister Immortal, Deadpool has died in so many darkly hilarious ways that it’s impossible to keep him off this list. Much like the Mad Titan himself, Deadpool has a reoccurring love interest in Lady Death. Of course this means he is constantly allowing himself to be offed in order to be with her. Some of the more memorable Deadpool deaths include the time he was killed by Nightcrawler in Age of Apocalypse (via having his head teleported away from his body) or the time Thanos murdered the Merc only to immediately resurrect him. Surprisingly the best death the Merc with the Mouth has ever had was the one that was the most serious. Right before the newest Secret Wars arc, the entire 616 Universe collided with the Ultimate Universe, killing several characters from each world. In his dying moments, Deadpool realized that his friends loved him for who he was and that he didn’t need to try and be anyone else but himself. For someone with a healing factor and a skeleton made of unbreakable metal, Wolverine sure has died a lot. We guess that’s a given when you actually think about it; what is more shocking to X-Men fans than killing off the guy that’s supposed to be indestructible? Though Logan is apparently gone “for good” (yeah, right) after his recent death in The Death of Wolverine, he has bit the dust a ridiculous amount of times throughout his history. The comic version of Days of Future Past saw Logan incinerated by one of the mutant-hunting Sentinels. In a different alternate future, an evil version of Beast (now a Horseman of Apocalypse) used the Phoenix Force to turn off Wolverine’s healing factor before disemboweling the mutant. Seriously, alternate timelines are never fun for this guy. Others show him getting killed by losing his heart, being electrocuted to death, getting bitten by a zombie, or even having Kitty Pride phase her hand into his brain (resulting in some downright disturbing imagery). Although our favorite mutant has never stayed dead for long in canon, Marvel claims that Logan is deceased for the foreseeable future after being frozen in place by molten adamantium. Here’s a death so powerful that it almost took the entire comic industry with it. We all know that Superman met his end at the hands of Doomsday both in the Death of Superman comic arc and in last year’s Batman V Superman: Dawn of Justice. When it initially happened it was a shock to the world; the Man of Steel was supposed to be the indestructible symbol of truth, justice, and the American way. You can’t kill Superman! Invulnerability is his entire shtick! Alas, it happened. And you may be surprised to know that 1993 wasn’t even the first time it had happened. One of the earliest happened back in the ‘60s in a bizarre plotline involving a school that trained people to kill Superman. They eventually succeeded by overexposing the Man of Steel to Kryptonite radio waves only to have him be revived by a robot clone of himself (the ‘60s were a weird time in comic books). He was also murdered every single day of the year by Grog, the villain from Kingdom Come in the story’s somewhat sequel, The Kingdom. Have we also mentioned that Kal-El isn’t immune to magic? He’s been killed by a magic spell so many times that we’ve lost count. Somehow, having God-like immunity doesn’t do you much good when everyone and their brother seems to know the one thing that you are vulnerable to. The Incredible Hulk is a god-tier character whose strength knows no limits. Literally. Many incarnations of the Hulk have him get stronger and stronger the angrier he becomes. When he’s at full strength he can even make heavy hitters like Thor look like children. 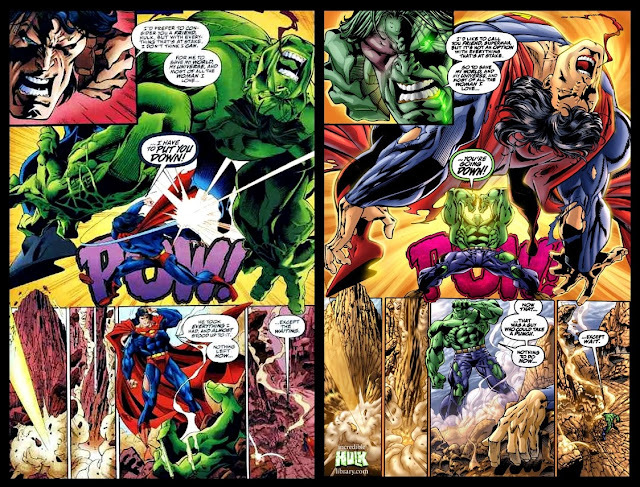 Then there is the eternal debate: Could the Hulk beat Superman in a one on one fight? Evidence suggests yes. There’s just about nobody in the Marvel universe that can hold a candle to Hulk when he’s at full power. It’s not just super strength, either; Bruce Banner reveals in The Avengers that his alter ego can even subconsciously prevent himself from committing suicide. Even though Marvel’s Jade Giant can survive a punch from the Man of Steel and is about invulnerable as you can get, you wouldn’t believe how many times he’s been killed. Most recently he was taken down by an “Anti-Hulk Arrow” from Hawkeye as he was about to go on a rampage. This was far from the first time the seemingly impervious superhero was killed off. Back in 1990, the appropriately titled The Death of the Incredible Hulk, which acted as the series finale to the Bill Bixby/Lou Ferrigno TV show, had the monster die by being thrown from an exploding helicopter. The Abomination kills him during their first encounter, and Wolverine cuts him up from the inside out in the bizarre-yet-amazing Old Man Logan story after being eaten alive by the beast. Huh. Every now and then we are introduced to a big bad that is touted as being so powerful that they can manipulate the very fabric of the universe or destroy an entire planet at their whim. This makes it so that there can only be one way for them to be defeated: death. Enter Thanos, the character who has acted as Marvel’s flagship celestial baddie since his intro back in Iron Man #55. Whenever this character shows up, you know some very bad things are about to go down; Thanos is obsessed with Lady Death and will do anything to please her, including destroying entire universes and killing every single superhero that exists. The irony is that he is cursed so that he may never die and thus can never be with Lady Death. But that doesn’t stop writers from trying! The Mad Titan has met his most famous “demise” at the hands of Drax the Destroyer (truly the face of badassery) by getting his heart punched out of his body. He has also been turned to stone by Adam Warlock, obliterated in the Battleworld by Dr. Doom after he received God-like powers, and literally used his own transdimensional power to wipe himself out of existence in order to save the world. He may always come back, but Thanos is most certainly less invincible than he was originally made out to be. This is it, guys, the entity that is said to be the most powerful being in the entire Marvel universe. Its power is so legendary that even characters like Thanos, Galactus, and Apocalypse tremble in fear when they witness its presence. The Phoenix Force first made its appearance in Uncanny X-Men #101, where it had possessed Jean Grey and given her abilities beyond her wildest imagination. Although Jean is claimed to be the one true host to the entity, it has been embodied by multiple characters through the years. This entity is literally formed out of the essence of life and passion. That should be pretty hard to kill, right? Much like our last entry, the Phoenix Force ends up getting destroyed at the end of just about every major story it is featured in. Jean Grey nobly sacrificed herself in order to destroy the Phoenix the first time, but sure as day it didn’t stay dead for long. It is killed by Wolverine in the third (and arguably the worst) X-Men film when he is able get up close to Jean and stab her to death with his claws. Emma Frost allows the Phoenix Force to enter her body and kills it by turning herself to ice in Wolverine and the X-Men. Most recently, it was “killed” in Avengers vs. X-Men when the combined powers of Scarlet Witch and Hope Summers were able to completely disband the entity; there is no telling if or when it will reappear in the Marvel continuity. What do you think of our list? Are we being unfair to these indestructible characters? Let us know in the comments!